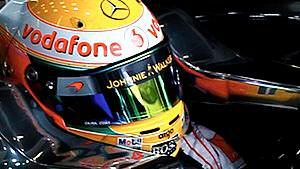 This is F1Minute - Lewis Hamilton leads both Friday practice sessions in Hungary. Lewis Hamilton led the way in both Free Practice sessions today at the Hungaroring, two tenths ahead of second place in each session. FP1 saw Sebastian Vettel take that second place, although his Red Bull teammate Mark Webber crashed, losing his front wing and ending his session a little early. Bruno Senna was sitting in for Nick Heidfeld in the Renault, getting his first chance behind the wheel this season. He finished the morning 15th, with teammate Vitaly Petrov 10th. FP2 had Fernando Alonso chasing Hamilton for the fastest time, with Jenson Button in third. There were no major incidents in the session, and most of the drivers completed a lot of laps, an average of 34, testing out the soft and supersoft compounds to see which is more competitive. Jarno Trulli, who is back in the car for Lotus after Karun Chandhok took his seat in Germany, was notably happier - finishing the day above his teammate, and complementing the team on their new and improved power steering.